Ford Motor Company of Southern Africa (Manufacturing) (Proprietary) Limited ("FMCSA") is the promoter of the Competition. 2.1 This Competition is conducted by Ford Motor Company of Southern Africa (FMCSA) and is open to everyone except directors, members or partners of FMCSA, FMCSA employees and their immediate families, FMCSA advertising, media and promotion agencies or dealers or any other person who directly or indirectly controls or is controlled by FMCSA or the supplier of goods or services in connection with the Competition. 2.2 The competition is open to residents of Nigeria only. 2.3 Participants may enter the competition on Facebook by posting a photo of themselves with their fathers, telling us why they think their dad is fearless and tough in no more than 50 words. 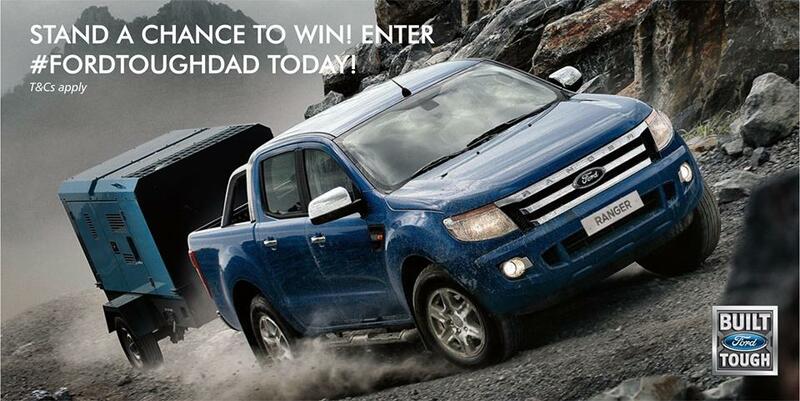 Participants also need to tag @FordNigeria also include the hashtag #RangerToughDad in the Post. 2.4 Participants may only post from his/her personal Facebook account. 2.5 Winners will be chosen via random draw. 2.6 The competition will run from 13 June 2016 to 17 June 2016. On 20 June 2016, the finalist will be announced on FMCSA’s Facebook profile. 2.7 The prize(s) or part of the prize(s) cannot be exchanged for cash and are not transferable. 2.8 The judges’ decision is final and no correspondence will be entered into. 2.9 By entering this competition, it is agreed that should you be the winner, FMCSA shall have the right to identify you as the winner of the competition and have photographs taken which may be published in printed media, or appear on the radio, the internet (including social media), email and/or television. 2.10 FMCSA accepts no responsibility of whatsoever nature for any injury, loss, expense or damage suffered or incurred by any participant or winner as a result of participating in this Competition or as a result of accepting any of the prizes. 2.11 By submitting an entry, participants accept the above terms and conditions. 2.12 All Submissions will become the exclusive property of FMCSA, and none will be acknowledged or returned. FMCSA shall have the right to edit, adapt and publish or not publish any or all of the Submissions, and may use them in any media without attribution or compensation to the entrant, his/her successors or assigns, or any other entity. 2.20 FMCSA reserves the right to disqualify any Participant who tampers with the entry process or enter the Competition in a way which is fraudulent, misleading, and deceptive or generally damaging to the goodwill or reputation of FMCSA or is in breach of these rules. 2.21 FMCSA will not be held liable for any technical malfunction of software, servers, computer equipment or systems, any e-mail or entry to be received on account of technical problems of traffic congestion on the Internet, telephone lines or at any website, or combination thereof, including any injury or damage to a Participant’s or any other person’s computer or mobile telephone related to or resulting from participation in relation to the Competition. By participating in the Competition, you agree that no claim relating to any such loss or injury (including without limitation special, indirect or consequential losses) shall be asserted against FMCSA. 2.22 Participants acknowledge that they are bound by these rules by the submission of their entry into the competition.